Review of Davis - "ALL THE FIGHTING THEY WANT: The Atlanta Campaign from Peachtree Creek to the City's Surrender, July 18-September 2, 1864"
Given the enormous scale of the 1864 North Georgia Campaign and the relatively tight constraints of the Emerging Civil War series of topical overviews, it's entirely appropriate that Stephen Davis's treatment would be spread over two volumes. In 2016, Davis took readers to the gates of Atlanta with A Long and Bloody Task: The Atlanta Campaign from Dalton through Kennesaw to the Chattahoochee, May 5-July 18, 1864, and, as promised, the companion book All the Fighting They Want: The Atlanta Campaign from Peachtree Creek to the City's Surrender, July 18-September 2, 1864 is now appearing a year later. Like the first book, there is a lot of ground to cover in the second volume. Davis begins with a brief discussion of John Bell Hood's Civil War career and ascension to command of the Army of Tennessee at a critical moment in the Atlanta Campaign. What follows this introduction is a series of chapters recounting the Battle of Peach Tree Creek, The Battle of Atlanta/Bald Hill, Ezra Church, the various Union cavalry raids conducted behind Confederate lines, the decisive severing of the last rail line into the city between Rough and Ready and Morrow's Station, and the Battle of Jonesboro. Davis's narrative style is well-suited to the popularly-focused ECW series. It's masterfully succinct (only a handful of pages can be devoted to each battle), expertly zeroing in on the most salient points of interest associated with each event. It's also lively, with occasional charming moments of cheek. Davis is the modern authority on the bombardment of Atlanta [he wrote the book on it (What the Yankees Did to Us: Sherman's Bombardment and Wrecking of Atlanta, 2012)] and a chapter is devoted to the shelling of the city. The majority of the civilian population was evacuated beforehand, which helped keep non-combatant casualties relatively low. One of the freshest and most interesting discussions is contained in Chapter 12. In it, Davis recounts Hood's successful efforts at partially replacing his considerable losses from the three late-July battles around Atlanta*. Through internal sources like scouring army hospitals for able-bodied men, granting amnesty for AWOL individuals, recalling soldiers from detached/extra duty, drafting teamsters, reducing the gun crews of every artillery battery by one man, and soliciting the expansion of the state militia contingent (eventually to 5,000 men), Hood was actually able to materially increase his fighting numbers in the weeks following Ezra Church. The leadership traits of the opposing high commands as expressed in the book are generally in line with current understanding. In All the Fighting They Want, readers find a passive Joe Johnston who would not roll the dice and risk his army, an operationally brilliant William T. Sherman who preferred sweeping movement to direct assault, and a John Bell Hood who also sought to strike at the enemy through maneuver yet was seemingly cursed by the fortunes of war to end up attacking in front. Davis, like Albert Castel and others before him, can be quite critical of Sherman's battlefield generalship, but he does clearly express a deep appreciation of the magnitude of Sherman's accomplishment and the uncommon skills that were required in achieving it. Beyond the obvious choice of the senior Hardee, it would have been interesting to read the author's thoughts on viable alternate candidates to Hood for succeeding Johnston. A proliferation of maps and images has always been a notable strength of the ECW series, and readers will not be disappointed here. Given the unfortunate truth that urban sprawl has almost entirely obliterated the Atlanta battlefields, Davis makes up for the paucity of visually interesting landmarks and landscapes with a photographic catalog of seemingly every surviving historical plaque in the area. This particular book probably has the richest photo captions of the entire ECW series, too. The driving tour hits 12 stops in metro Atlanta related to the three July battles. In the appendix section, you'll find a photograph and text catalog of Atlanta monuments, a brief description of the artifact collections held by the Atlanta History Center, and a short history of the Atlanta cyclorama (which was moved to the History Center in 2016, with a grand opening planned for 2018). Orders of battle complete the volume. Representing the condensed knowledge of a noted authority, A Long and Bloody Task and All the Fighting They Want together offer readers a fine introduction to the Atlanta Campaign. Given the status of the Atlanta battlefields as some of the foremost victims of urban sprawl and missed preservation opportunities, the second volume also serves as a useful record of surviving landmarks and monuments. * - Davis notes the July 10 Army of Tennessee official strength return as 59,196 and casualties from the July 20, 22, and 28 battles as 10,800, for an end of July army strength of 48,396. Unless another point escaped notice, I'm not sure why the author deems that number "remarkable" given it's precisely the expected figure. Regardless, the official August 10 return indicating a 3,500+ increase in manpower without outside reinforcement is remarkable. I was thinking during Memorial Day that the crafting of Civil War history doesn't attract nearly the indefatigable numbers nerds that it should. Most historians are more than content to simply pass along the round numbers of their scholarly forebears. More surprising than the very high probability that Civil War related mortality has been grossly underestimated for a century and a half is the fact that it took so very long for someone like J. David Hacker (according to the NYT "a specialist in 19th-century demographics") to come along and use his professional expertise to question one of the biggest round numbers in the business. That around two-thirds of Civil War deaths were non-combat related and that an estimated 50,000 civilians died during that war are other frequently cited statistics. The 50,000 figure for civilian deaths is little more than a number drawn out of a hat. Similarly, Michael Fellman's conjecture that perhaps 10,000 civilians were killed in the Missouri home front violence alone is little more than that, an educated guess with no systematic investigative analysis to back it up. Given the scale of human deprivation and migration (forced and unforced) that occurred during the war, and the appalling conditions that existed in so many refugee camps, you would have to think that the 50,000 mortality figure is a lower bound for the war's direct and indirect violence against civilians. 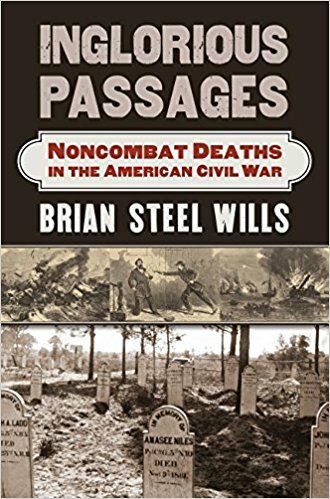 These kinds of questions are what intrigue me most about an upcoming book, Brian Steel Wills's Inglorious Passages: Noncombat Deaths in the American Civil War (Kansas, Nov 2017). 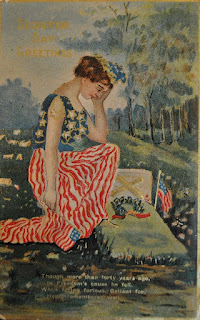 From the description: "Of the hundreds of thousands of soldiers who died in the Civil War, two-thirds, by some estimates, were felled by disease; untold others were lost to accidents, murder, suicide, sunstroke, and drowning. Meanwhile thousands of civilians in both the north and south perished—in factories, while caught up in battles near their homes, and in other circumstances associated with wartime production and supply. These “inglorious passages,” no less than the deaths of soldiers in combat, devastated the armies in the field and families and communities at home. Inglorious Passages for the first time gives these noncombat deaths due consideration." Official descriptions sometimes don't represent well a book's true content and range, but the word "stories" is used twice in second paragraph, with that point of emphasis set against the "the cold calculations of statistics," so my hopes for a more quantitative focus are a bit muted at this point. Regardless, I look forward to reading it. 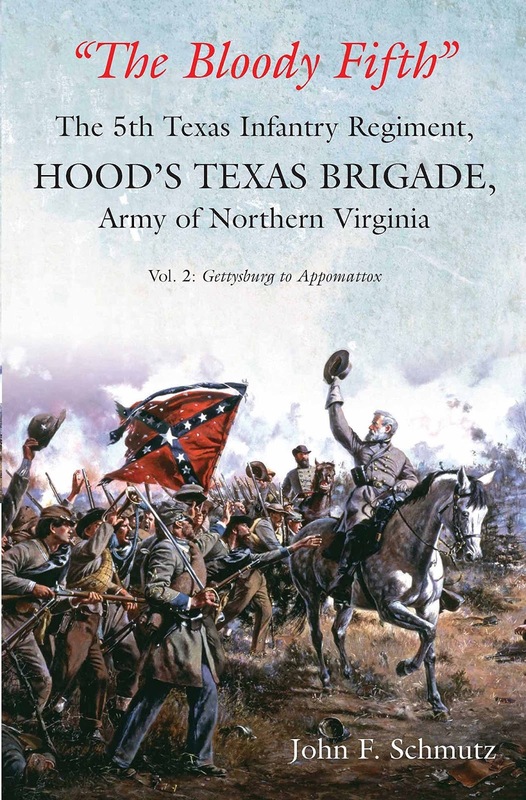 • "The Bloody Fifth" The 5th Texas Infantry Regiment, Hood's Texas Brigade, Army of Northern Virginia - Volume 2: Gettysburg to Appomattox by John F. Schmutz (Savas Beatie, 2017). In a recent ACW magazine review, the elder Krick expressed some pretty profound disappointment in finding the omission of numerous known primary sources in Volume 1, but even with that research criticism in mind it would be difficult to argue that Schmutz's bibliographies aren't far meatier than those found in the typical Civil War regimental study. The first book ended with the Suffolk Campaign, and Volume 2 "continues the regiment’s rich history from its march north into Pennsylvania and the battle of Gettysburg, its transfer west to Georgia and participation in the bloody battle of Chickamauga, operations in East Tennessee, and the regiment’s return to Virginia for the overland battles (Wilderness to Cold Harbor), Petersburg campaign, and the march to Appomattox Court House. The narrative ends by following many of the regiment’s soldiers on their long journey home." The book is well-stocked with photos and maps. For the latter, it almost seems like one appears every handful of pages. The appendix section has four parts. The first is a list of non-combat deaths organized by year and company, the second battle deaths arranged in the same manner, the third a head count of Texans that served in the 5th, and the fourth is an author interview. • Regular Army O! 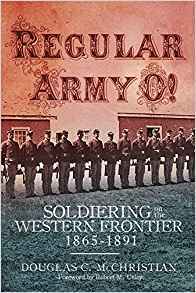 : Soldiering on the Western Frontier, 1865-1891 by Douglas C. McChristian (Univ of Okla Press, 2017). Douglas McChristian has certainly established himself within the top echelon of frontier army historians. I had not heard of him before encountering his masterful 2009 study Fort Laramie: Military Bastion of the High Plains (another great Arthur H. Clark publication). Jerome Green and intro writer Robert Utley both rave about this new book being the most complete portrait of Regular Army life on the frontier between the end of the Civil War and the conclusion of the Indian Wars. "At once panoramic and intimate, Regular Army O! uses the testimony of enlisted soldiers—drawn from more than 350 diaries, letters, and memoirs—to create a vivid picture of life in an evolving army on the western frontier." McChristian "plumbs the regulars’ accounts for frank descriptions of their training to be soldiers; their daily routines, including what they ate, how they kept clean, and what they did for amusement; the reasons a disproportionate number occasionally deserted, while black soldiers did so only rarely; how the men prepared for field service; and how the majority who survived mustered out." A quick run through the chapters reveals a remarkably comprehensive examination of the soldier experience, including recruitment, enlistment, the journey to the front, garrison life, army material culture, relationships between officers and men, hygiene and medical care, training, and what it was like operating in the field. Also addressed in the study are the darker aspects of the frontier army, to include desertion, disease, alcoholism, suicide, and prostitution/VD. This looks like a must-have addition to the Indian Wars library. 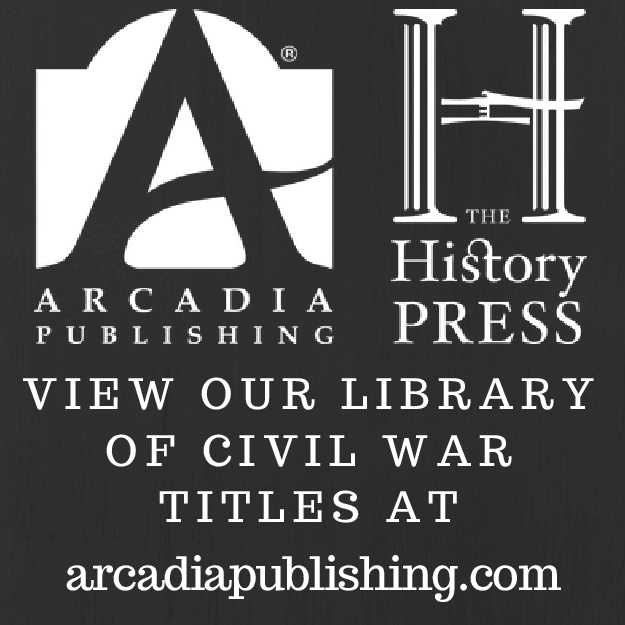 The Arthur H. Clark Company is one of the premier publishers of Western Americana, and they can always be counted on to publish some Civil War related books every once in a while. The Civil War in the Mountain West has received a bit more attention lately, most recently with The Civil War Years in Utah: The Kingdom of God and the Territory That Did Not Fight (Oklahoma, 2016) by John Gary Maxwell, and this summer Arthur H. Clark will release an edited documentary collection titled Utah and the American Civil War: The Written Record (August). Edited by BYU history professor Kenneth L. Alford, "Utah and the American Civil War presents a wealth of primary sources pertaining to the territory’s participation in the Civil War—material that until now has mostly been scattered, incomplete, or difficult to locate. Organized and annotated for easy use, this rich mix of military orders, dispatches, letters, circulars, battle and skirmish reports, telegraph messages, command lists, and other correspondence shows how Utah’s wartime experience was shaped by a peculiar blend of geography, religion, and politics." Listed at 864 pages, it's stuffed with material. Alford "opens the collection with a year-by-year summary of important events in Utah Territory during the war, with special attention paid to the army’s recall from Utah in 1861, the Lot Smith Utah Cavalry Company’s 107-day military service, the Union army’s return in 1862, and relations between the military and Mormons. Readers will find accounts of an 1861 attempt to court-martial a Virginia-born commander for treason, battle reports from the January 1863 Bear River Massacre, documents from the army’s high command authorizing Governor James Doty to enlist additional Utah troops in October 1864, and evidence of Colonel Patrick Edward Connor’s personal biases against Native Americans and Mormons. A glossary of nineteenth-century phrases, military terms, and abbreviations, along with a detailed timeline of key historical events, places the records in historical context." This sounds like a wonderful resource, and I can't wait to look through it. Review of Belcher - "THE CAVALRIES AT STONES RIVER: An Analytical History"
Published last year, Dennis Belcher's first-of-its-kind history of the cavalry of the Army of the Cumberland [see review] ably traced the development and operations of the Union mounted arm in the western heartland. In that book Belcher lamented how understudied the mounted actions of the Middle Tennessee Campaign of winter 1862-63 have been in the existing literature. Taking up the banner himself, his new study, The Cavalries at Stones River: An Analytical History, emphatically fills the void. Part One looks at the movements of Union and Confederate cavalry beginning with the conclusion of the 1862 Kentucky Campaign and running up through Christmas Day of that year. The book provides a solid overview of the winter repositioning of both armies in Middle Tennessee and describes in some detail the many skirmishes and raids fought between the opposing cavalry forces. Given the foraging value of the area's fertile plains, both sides sought to control as much of the countryside as possible. Belcher does a good job of defining the strengths and weaknesses of each side's mounted arm during the late-1862 period. Confederate cavalry chief General Joseph Wheeler's command certainly had shortages of arms and equipment, but its ranks were much more numerous (collectively comprising over 20% of total army strength) and initially better organized than their Union counterparts, who were parceled out to infantry control and persistently short on good horses. Critics of Army of the Cumberland commander William S. Rosecrans chide him for excessive preparation (the kind of deliberate style of generalship that got his predecessor, Don Carlos Buell, removed), but Belcher is much more sympathetic to Rosecrans's considerable problems, especially those concerning the serious material and manpower weaknesses of the Union mounted arm. The author compellingly supports Rosecrans's contention that the Union cavalry needed to be sorted out first before any general advance could be considered. The important role the "new" Union cavalry played in keeping their highly aggressive enemy counterparts at bay (and staving off disaster at several key points) during the Stones River Campaign seems to bear out the legitimacy of such a viewpoint. According to Belcher, Rosecrans should share credit with new cavalry chief General David Stanley for achieving such a quick turnaround in organization, arms, mounts, and confidence. Part Two of the book discusses at length the cavalry organization of both armies, in the process providing informative capsule unit histories of the opposing regiments and batteries. This section usefully supports the main narrative but also should serve readers well in the role of a reference tool. The organizational tables collected throughout the book are helpful, as well. 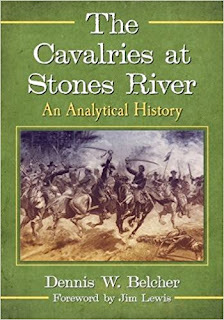 Part Three comprises roughly half the book's narrative and recounts in minute fashion the cavalry's actions during the campaign and battle of Stones River. For the opening days of the campaign, Belcher effectively argues that the mounted brigades of both sides achieved their respective goals. Though roughly handled in spots, Wheeler's brigades were able to keep the enemy's heavy columns from unexpectedly striking the Confederate infantry and they also provided enough breathing space to allow the Army of Tennessee to concentrate at Murfreesboro without great hindrance. On the federal side, Stanley's troopers effectively screened the Union advance, seized vital water crossings intact, and protected the Army of the Cumberland's flanks and rear from enemy strikes. During the next phase of the campaign, cavalry skirmishing continued until both armies settled into positions opposite one another and in front of Murfreesboro. On December 30, Wheeler embarked on a 60-mile raid around the Army of the Cumberland, disrupting the Union lines of communication with Nashville by capturing supplies and destroying isolated wagon trains. On the following day, the Battle of Stones River would begin. On the morning of the 31st, with so many Union and Confederate cavalry still off to the north (including chiefs Wheeler and Stanley), mounted fighting was concentrated on the western extremity of the Stones River battlefield, with Colonel Lewis Zahm's blue brigade facing off with General John A. Wharton's more numerous gray troopers. Wharton offered indispensable assistance to the main Confederate attack, repeatedly turning the Union right throughout the morning hours and capturing great numbers of men and equipment. After finally dispersing Zahm's plucky brigade, they even briefly captured the Army of the Cumberland's main supply train before being driven off by reformed enemy units and fresh reinforcements (most prominent among the latter the 4th U.S. Cavalry regiment). For all the damage done by Wheeler's raid on the 30th, the author is undoubtedly correct that the Confederate cause would have been even better served by the tactical presence of Wheeler and his men on the main battlefield on December 31. On the Union side, the leadership of cavalry division commander Colonel John Kennett was far from effective on the 31st, further reinforcing the propriety of placing Stanley above him as army chief of cavalry. On the east end of the battlefield, across Stones River, General John Pegram's brigade of two cavalry regiments has been blamed by some, then and now, for providing false intelligence regarding the continued presence of heavy Union forces on that flank subsequent to the aborted morning advance of Van Cleve's federal division. This alleged failure in turn kept General Breckinridge from sending timely reinforcements from his division to support the main Confederate attack in the center opposite the Round Forest. In the author's determination, there is too little documentation available (after early morning, only a single 10am dispatch survives) to support the view that Pegram was derelict in his information gathering duties (or was the party responsible for the false report of a Union column coming down the Lebanon Pike behind the Confederate right). The more likely explanation for the command missteps on the right is one of simple miscommunication between Breckinridge and Bragg, who heartily disliked one another. According to the author, there just isn't enough evidence available to assign blame for the alleged intelligence failures on the Confederate right to anyone in particular. Certainly there was enough Union activity at the fords (including that of engineer troops) to sow further confusion over their intentions. What more could have been achieved by throwing additional troops against the strong Union center is questionable anyway. The final cavalry phase of the December 31 battle occurred during the mid to late afternoon hours, when Stanley and Colonel Robert Minty arrived on the Union far right flank, to the confront the Confederate brigades of Wheeler and General Abraham Buford, who also reached the main battlefield late in the day (replacing Wharton's exhausted troopers). Initially, forced to give ground, Stanley spied an opportunity for a mounted charge, and, in the final act of the day, outflanked and drove back the Confederate cavalry. The action again demonstrated to all the value of Stanley's judgment and leadership qualities, but it also illustrated a contrast in fighting style between Wheeler's dismounted cavalrymen and Stanley's use of the saber for shock effect. On New Year's Day 1863 Wheeler was again tasked with taking his cavalry behind the enemy army and attack its trains, many of which were conveying Union dead and wounded back to Nashville. This time, the federal cavalry was much better prepared for Wheeler's foray. Wharton's brigade failed to dislodge the 1st Michigan Engineers and Mechanics near La Vergne, and the main body with Wheeler was repulsed after destroying only a few wagons. On January 2, like they had two days earlier, right flank communication breakdowns between army headquarters, division commander Breckinridge, and the cavalry meant that Pegram (and now Wharton) were given no clear instructions from above to participate in the Confederate attack, which was decisively repulsed. There's no indication that the cavalry could have changed the result, but the botched coordination effort gave all concerned another public black eye. In further raid action on January 3, Wheeler fought a skirmish at Cox Hill and his mistaken report that Rosecrans was being heavily reinforced is cited by some as heavily influencing Bragg's decision to retreat, a criticism that the author reasonably dismisses as a convenient cover. The author certainly appears to have done his homework. He integrates a wide array of primary sources into his study, including a numerous and geographically wide assemblage of manuscript resources. Belcher also consulted a multitude of unit histories, government documents, and newspapers to go along with his demonstration of a solid grasp of the relevant published literature. The historical narrative is also well supported by maps from noted cartographer George Skoch. On the complaint side, some repetitious passages could have been trimmed away and there is a superabundance of typos in the text. Belcher, who praises Stanley throughout, is more divided on Wheeler's performance, though he seems higher on Wheeler's potential and later war career than most modern critics. While Bragg was complicit in the raiding philosophy that took valuable cavalry away from tactical support of the main army, Wheeler too often acted like another brigade commander rather than chief of cavalry (indeed he retained personal command of his old brigade). Such failings Belcher primarily attributes to Wheeler's inexperience in carrying out his new responsibilities. Though Wheeler's raid on the 30th, his one truly noteworthy achievement of the campaign, would result in much material damage, it did not affect at all the fighting capacity of Rosecrans's army. In addition to his intelligence gathering mistake on the 3rd, the rest of his battlefield actions outside December 30 were either modest gains or defeats, but Belcher once again views those events as evidence of growing pains rather than demonstrations of ingrained incapacity. The military merits of Joe Wheeler will always remain a source of debate. Though the old stereotype of the southern cavalryman superior in both marksmanship and riding ability will seemingly never die, the book's portrait of the Union cavalry's speedy qualitative transformation under Rosecrans and Stanley convincingly reinforces the view that, in terms of comparative performance in the field, leadership and organization trumped most other factors. Belcher's book convincingly frames the Stones River Campaign as the first major step taken by the western Union cavalry toward achieving operational and tactical parity with their southern foes. With David Powell's definitive series of Chickamauga studies and now Dennis Belcher's work on Stones River, we now have fully developed descriptive accounts and analyses of cavalry leaders, forces, and operations during the two signature campaigns fought between the Union Army of the Cumberland and the Confederate Army of Tennessee. The Austin Civil War Round Table's Laney Prize is "awarded each year to the author of the book that best advances the knowledge of the Civil War's military or political events and the Americans who took part in those events." Yesterday's press release from the ACWRT announced that the newest prizewinner (the 22nd recipient) is David Powell for The Chickamauga Campaign―Barren Victory: The Retreat into Chattanooga, the Confederate Pursuit, and the Aftermath of the Battle, September 21 to October 20, 1863 (Savas Beatie, 2016). With the honoring of the final volume as noteworthy capstone to a stupendous trilogy, it is appropriate that Powell's work has been given the Peter Jackson treatment. 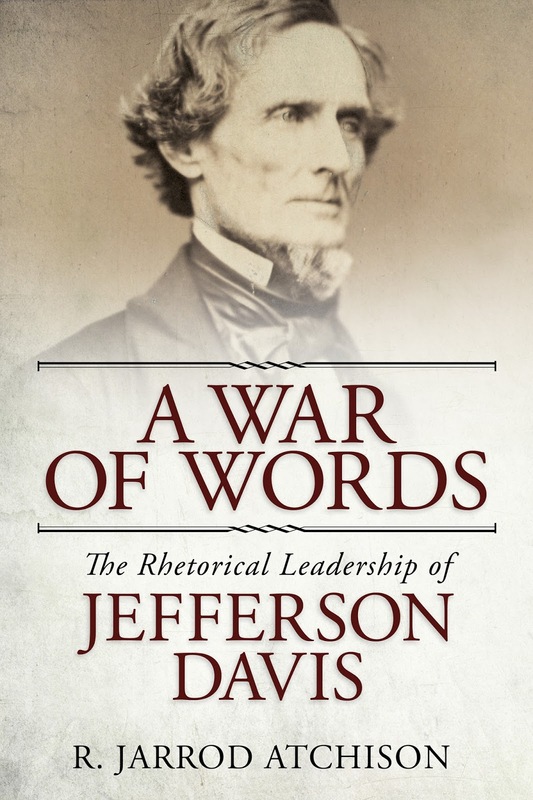 • A War of Words: The Rhetorical Leadership of Jefferson Davis by R. Jarrod Atchison (Univ of Ala Pr, 2017). In terms of their rallying their people to a common cause and eliciting support for government policies (especially the most controversial measures), the rhetorical powers of President Davis are typically deemed to have paled in comparison to those used by President Lincoln during the Civil War. R. Jarrod Atchison’s A War of Words is the first in-depth analysis of the leadership effectiveness of Davis's public speaking. The study "uses concepts from rhetorical theory and public address to help answer a question that has intrigued scholars from a variety of disciplines since the collapse of the Confederacy: what role, if any, did Davis play in the collapse of Confederate nationalism?" Instead of focusing on the consequences to the Confederate nation of Davis's military decision-making, the book argues that "Jefferson Davis’s rhetorical leadership should have been responsible for articulating a vision for the nation—including the core tenets of its identity, the values the nation should hold dear, the principles it should never compromise, and the goals it should set for its future." Expressing the idea that "being a great orator is not synonymous with successful rhetorical leadership," the author "posits that Davis’s initial successes constrained his rhetorical options later in the war. A War of Words concludes that, in the end, Davis’s rhetorical leadership was a failure because he was unable to articulate a coherent Confederate identity in light of the sacrifices endured by the populace in order to sustain the war effort." by Gregory F. Michno (Savas Beatie, 2017). The most recent major work on Sand Creek is Ari Kelman's A Misplaced Massacre: Struggling over the Memory of Sand Creek (2013). I requested a review copy at the time of publication, didn't get it, and haven't picked up a copy yet. My local library buyers (fiction and non-fiction) are terrible so no luck there. A book I have had on the shelf for almost ten years now, and still haven't gotten around to reading, is Greg Michno's Battle At Sand Creek: The Military Perspective (2003). His new book The Three Battles of Sand Creek is organized into three parts. "The first, 'In Blood,' details the events of November 29 and 30, 1864, in what is surely the most comprehensive account published to date. The second section, 'In Court,' focuses on the three investigations into the affair, illustrates some of the biases involved, and presents some of the contradictory testimony. The third and final section, 'The End of History,' shows the utter impossibility of sorting fact from fiction." More from the description: "Living in a postmodern world of relativism suggests that all history is subject to the fancies and foibles of individual bias. 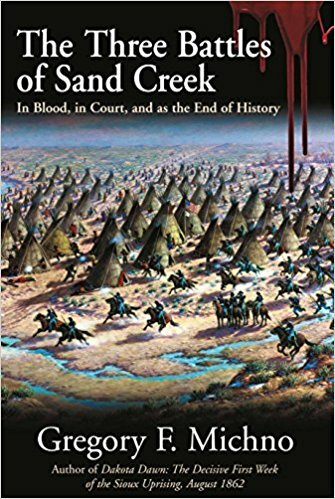 The example of Sand Creek illustrates why we may be witnessing “the end of history.” Studying Sand Creek exposes our prejudices because facts will not change our minds―we invent them in our memories, we are poor eyewitnesses, we follow the leader, we are slaves to our preconceptions, and assuredly we never let truth get in the way of what we already think, feel, or even hope. We do not believe what we see; instead, we see what we believe." History has always had the kind of problems listed above, but certain topics (like the Indian Wars in North America) inarguably attract greater extremes. I surely don't envy being part of the firestorm that inevitably occurs when Indian Wars historians dare to question sacred cows of the most controversial sort. 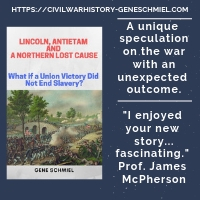 • Lincoln's Pathfinder: John C. Fremont and the Violent Election of 1856 by John Bicknell (Chicago Review Pr, 2017). Though James Buchanan triumphed over John C. Fremont in the contest for the office of the U.S. presidency in 1856, the Republican showing was impressive enough to convince its followers that future victory was in the cards, even with a complete absence of southern votes. The 1856 results are commonly viewed as a harbinger of national electoral victory sooner rather than later, but, at least in comparison to 1860, the election itself hasn't received a great deal of attention in the popular literature. 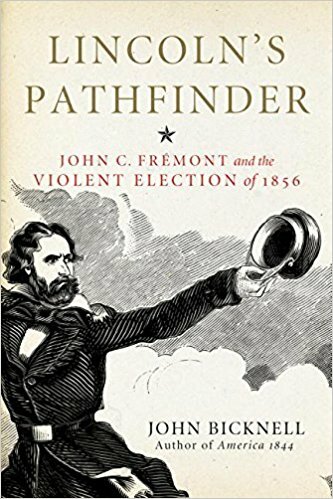 As the title suggests, this important event is the chief consideration of John Bicknell's new book Lincoln's Pathfinder: John C. Fremont and the Violent Election of 1856. From the description: "The 1856 presidential race was the most violent peacetime election in American history. War between proslavery and antislavery settlers raged in Kansas; a congressman shot an Irish immigrant at a Washington hotel; and another congressman beat a US senator senseless on the floor of the Senate. But amid all the violence, the campaign of the new Republican Party, headed by famed explorer John C. Frémont, offered a ray of hope: a major party dedicated to limiting the spread of slavery. For the first time, women and African Americans actively engaged in a presidential contest, and the candidate’s wife, Jessie Benton Frémont, played a central role in both planning and executing strategy, and was a public face of the campaign. Even enslaved blacks in the South took hope from Frémont’s crusade." Review of Roth - "J.O. SHELBY AT CLARENDON, ARKANSAS: The Capture and Destruction of the U.S.S. Queen City"
Upon the costly but successful conclusion of the Camden Expedition (the Arkansas wing of the Red River Campaign) in spring 1864, the Confederate leadership in the Trans-Mississippi sent Joseph O. Shelby and his command behind enemy lines into NE Arkansas. There, the newly promoted General Shelby became in effect the sole Confederate military authority in the region, suppressing outlaws and guerrillas, vigorously enforcing conscription in anticipation of a fall expedition into Missouri, and conducting hit and run attacks on Union forces. One of Shelby's most notable military achievements during this period was his brigade's surprise attack and destruction of the tinclad gunboat U.S.S. Queen City in June 1864. That dramatic event is the focus of Don Roth's book General J. O. Shelby at Clarendon, Arkansas: The Capture and Destruction of the U.S.S. Queen City. A slim volume of only 60 total pages, the study consists of a narrative history of the operation plus a number of brief appendices, among them a partial roster of Bledsoe's Battery (the unit that battered the vessel into submission), a sampling of artifacts taken from the wreck during a 1977 archeological survey, and a list of black sailors rescued from the sinking. Also covered to satisfaction in the book is the Union response to the loss of the Queen City. Fearing the captured vessel's conversion into a Confederate gunboat, federal authorities quickly outfitted against Shelby a powerful naval flotilla accompanied by a full infantry division with a sizeable mounted detachment. Roth ably recounts the running engagement that ensued. Though Shelby and his field guns were overwhelmed by the Union Navy's weight of shot, the well-mounted Confederates were able to escape with relative ease. In the process, however, much of the fruits of Shelby's victory were lost. Due to the swiftness of the enemy's reaction, much of the offloaded equipment had to be abandoned and the disabled tinclad with its precious heavy guns burned to prevent recapture. The Queen City escapade offers a clear demonstration of the danger that mobile Confederate forces armed with artillery posed to Union military and civilian shipping on the western rivers, a threat that was fully appreciated at the time by both sides. The pair of previously captured Parrott rifles used to rapidly force the surrender of the formidably armed Queen City are illustrative of how much more damage could have been inflicted had Confederate forces in the West and Trans-Mississippi not been saddled with so much third-rate artillery, and even worse ammunition, throughout the war. Also, the ease of Shelby's escape further showcased the futility of using primarily infantry (no matter what the number involved) to catch veteran cavalry. The text is marred by a number of typos, but the main complaint is with the cartography. The two maps that are present are fine enough representations of the geographical area involved and Shelby's movements in the region, but no small-scale maps depicting either the June 24 fight at Clarendon or the revenge-seeking Union expedition that followed the Queen City's capture were included. The Queen City incident is too small to merit mention in most general histories, but it has not been neglected within the Civil War literature as a whole. White River naval operations have enjoyed fairly good coverage over the years, and fine accounts of Jo Shelby's 1864 activities in NE Arkansas have been published before in historical journals and in a 2007 essay anthology. While not the first of its kind in terms of subject matter, Roth's streamlined study of Shelby's victory is a solid one that does represent the first standalone publication of the event. • Joseph Brown and His Civil War Ironclads: The USS Chillicothe, Indianola and Tuscumbia by Myron J. Smith, Jr. (McFarland, 2017). From the description: "A Scottish immigrant to Illinois, Joseph Brown made his pre-Civil War fortune as a miller and steamboat captain who dabbled in riverboat design and the politics of small towns. 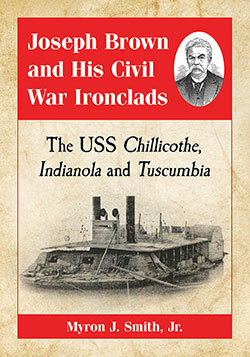 When war erupted, he used his connections (including a friendship with Abraham Lincoln) to obtain contracts to build three ironclad gunboats for the U.S. War Department--the Chillicothe, Indianola and Tuscumbia." Brown's ironclads were distinctive-looking river craft (much different in appearance from the famous Pook Turtles) and weren't too highly regarded, but they usefully served the U.S. Navy throughout the conflict (except the Indianola, which was rammed and sunk by the Confederates in 1862). Smith's books on the men and vessels of the Union and Confederate river navies in the west are numerous, and you can find reviews of all of them on this site. Some readers might find the level of detail contained in Smith's narratives crushing, but those with a special interest in the topic will revel in their depth. Smith's interests in man and machine have always gone hand in hand in his work, and "(t)his book covers [Brown's] life and career, as well as the construction and operational histories of his controversial trio of warships." One of my favorite Civil War military history books from the 1990s is Chris Fonvielle's The Wilmington Campaign: Last Rays of Departing Hope (1997). It's a truly superior campaign study and easily the best of the handful of other Wilmington contenders. A couple of years later he followed it up with a really impressive history and map study titled Fort Anderson: The Battle For Wilmington . Fast forwarding to today, I was lamenting to myself the fact that I hadn't come across much of anything from him between then and now. However, it didn't take long to find out that he's still at it. Unbeknownst to me, far from retiring from the Civil War scene Fonvielle's instead kept himself incredibly busy releasing with a local publisher a boatload of new works on his apparently favorite subject. Before I did a quick web search today, I'd only heard of one of the books listed below. • Historic Wilmington & The Lower Cape Fear (2007). • Last Stand at Wilmington: The Battle of Forks Road (2007). • Fort Fisher 1865: The Photographs of T.H. O'Sullivan. (2011). • Faces of Fort Fisher, 1861-1864 (2013). • To Forge a Thunderbolt: Fort Anderson and the Battle for Wilmington (2015). Most of these books are pretty brief, but the last one appears to be a significantly revised and expanded version of Fonvielle's earlier Fort Anderson study. edited by Janne Lahti (Univ of Okla Press, 2017). Venturing off the beaten path of officers and generals, this collection "offers new perspectives by focusing on the lives of enlisted soldiers from a variety of cultural and racial backgrounds." 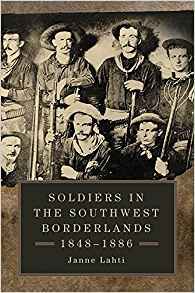 The ten biographical essays in Soldiers in the Southwest Borderlands reveal "the scholarship of experts who have mined military records, descendants’ recollections, genealogical sources, and even folklore to tell common soldiers’ stories." The time period covered in the book represents the years between the end of the U.S.-Mexican War and the subjugation of the tribes native to the Southwest. "The essays examine enlisted soldiers’ cross-cultural interactions and dynamic, situational identities. They illuminate the intersections of class, culture, and race in the nineteenth-century Southwest. The men who served under U.S. or Mexican flags and on the payrolls of the federal government or as state or territorial volunteers represented most of the major ethnicities in the West—Hispanics, African Americans, Indians, American-born Anglos, and recent European immigrants—and many moved fluidly among various social and ethnic groups." Several of the individuals showcased in the volume are Civil War soldiers, and readers will recognize many of the contributing authors (ex. William Kiser, Jerry Thompson, Megan Kate Nelson, Andrew Masich, and Robert Wooster) for their Civil War era scholarship. Adding more international perspective is volume editor Janne Lahti, a Finnish historian who specializes in American Studies at the University of Helsinki. In addition to supplying the book's introduction, he is also the author of the John Rope chapter. It is certainly not unusual to find two Civil War scholars researching unusual or previously neglected topics without knowledge of the other's work, but it does seem to occur with a strangely high frequency that their books end up getting published around the same time. Just when you thought Jonathan White had the dream world of Civil War soldiers and civilians all to himself for while (with Midnight in America: Darkness, Sleep, and Dreams during the Civil War ), you find that another study of wide thematic crossover is shortly on the way. Wanda Easter Burch's The Home Voices Speak Louder Than the Drums: Dreams and the Imagination in Civil War Letters and Memoirs will be published this summer. 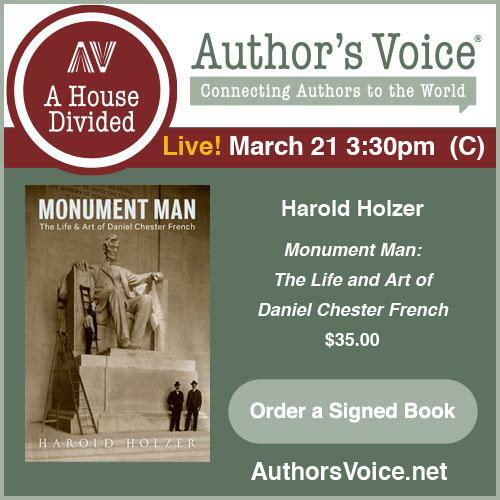 "Providing fresh perspective on the human side of the Civil War, (her) book explores the dreams and imaginings of those who fought it, as recorded in their letters, journals and memoirs. Sometimes published as poems or songs or printed in newspapers, these rarely acknowledged writings reflect the personalities and experiences of their authors. Some expressions of fear, pain, loss, homesickness and disappointment are related with grim fatalism, some with glimpses of humor." 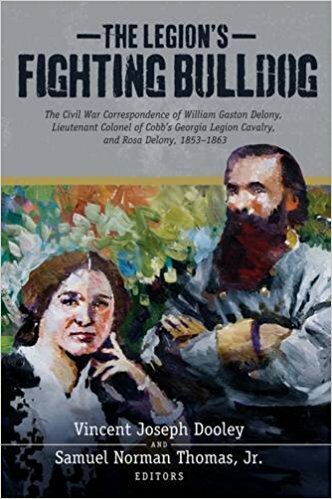 • The Legion's Fighting Bulldog: The Civil War Correspondence of William Gaston Delony, Lieutenant Colonel of Cobb's Georgia Legion Cavalry, and Rosa Delony, 1853-1863 edited by Vincent Joseph Dooley & Samuel Norman Thomas, Jr. (Mercer UP, 2017). Containing the voluminous back and forth letters written between a high-ranking officer of a famous cavalry unit and his wife, The Legion's Fighting Bulldog has all the elements of noteworthy Civil War correspondence. It's rather surprising that no one has published the collection before now. Lieutenant Colonel William Gaston Delony was a University of Georgia graduate and prewar lawyer who raised a company for the Cobb Legion of Georgia cavalry in the summer of 1861. His wife was the former Rosa Eugenia Huguenin. The editors of their letter collection are Vince Dooley (yes, that's right, the famous UGA football and 1980 National Championship winning coach) and Samuel Norman Thomas. Dooley is currently chairman of the Georgia Historical Society and Thomas the curator of the Thomas R.R. Cobb House. They add much valuable material to the volume, including a timeline, general introduction, footnotes, a pair of appendices, and an index. They also usefully organize the huge body of correspondence into fourteen chapters, beginning each with a lengthy introduction that offers detailed background and context for the letters than follow. The volume also contains a large number of good quality maps, a feature typically overlooked in books of this type. In his letters home, Delony describes his experiences of a number of key eastern theater military operations, including the Peninsula, Second Bull Run, Maryland, Fredericksburg, Chancellorsville, and Gettysburg campaigns. From the description: "These writings give the reader insights into what soldiers thought and felt, and of what their families went through, both on the battlefield and at home. Delony doesn't just write about his movements or the battles he has participated in, although he does a very good job of relaying information on that front, he also writes about the military and domestic activities taking place, as well as some of his innermost feelings. Delony expresses concern for his wife's struggles with her pregnancy as well as his own woundings, even though he attempts to play down the latter. Rosa's letters in response express her concerns for her husband and the wellbeing of their children." Unfortunately, things did not end well for the pair. On September 22, 1863 at the battle of Jack's Shop, Delony received a mortal wound, expiring soon after in a federal hospital in Washington on October 2.
Review of Reardon & Vossler - "A FIELD GUIDE TO GETTYSBURG, SECOND EDITION: Experiencing the Battlefield through Its History, Places, and People"
In 2013, Carol Reardon and Tom Vossler's A Field Guide to Gettysburg: Experiencing the Battlefield through Its History, Places, and People was released to wide acclaim. For historical narrative, interpretation, structure, directions, orientation, and maps, the guidebook is considered by many to be the very best of its kind for the war's most iconic battle. Popular reception of their Antietam follow-up volume* has been similarly enthusiastic. One of the 'problems' inherent to Civil War touring tools (and it's a good problem to have!) is the fact that battlefield appearance, preserved size, and interpretation are in constant flux. Gettysburg National Military Park is certainly among those battlefields that have best benefited from recent initiatives aimed at restoring historical viewsheds and terrain, and those changes are represented in A Field Guide to Gettysburg, Second Edition: Experiencing the Battlefield through Its History, Places, and People. Along with a few minor revisions/corrections from the first edition, the new version adds improved maps and roughly 25 pages of additional material. Most noticeably, there are two more tour stops (Day 1 - Harmon Farm fight, Day 3 - Powers Hill), raising the total number from 35 to 37. 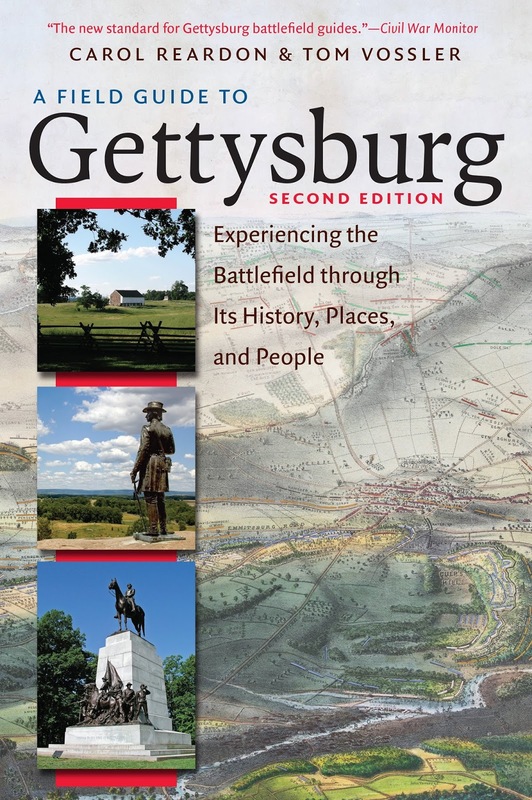 The digital version [A Field Guide to Gettysburg, Second Edition Expanded Ebook: Experiencing the Battlefield through Its History, Places, and People ] has also been significantly revised. It contains 10,000 words that had to be cut from the print versions due to space limitations and represents the ultimate version of the guide if handheld device touring is your thing. For those unfamiliar with the first edition, the book follows the traditional pattern of organizing battlefield tours into numbered stops presented in rough chronological order. Ideally, this guide is best used on a multi-day visit [to this end, the stop locations are helpfully sub-divided into three sections representing each of the battle's three days of fighting], but it does ably arrange the experience into enough smaller discrete parts so that those with limited time can still conduct meaningful short tours. Each stop begins with an Orientation section that directs visitors to the exact spot where they can make full use of the information provided. The authors carefully orient readers in all directions, using both event and landscape points of reference (with the latter also sometimes labeled on photographs). The attention to detail, here and elsewhere, is exemplary. Viewer orientation is also carried over to the cartography, with each numbered and/or lettered stop marked on-map and also accompanied with a directional viewpoint arrow. At just the right depth, the narrative history accounts of military events associated with each location are detailed enough for readers to gain a full picture of events without being onerous (no one wants to spend the whole time in the field reading). The text is authoritative and sourced (with the notes located at the rear of the book). In support are modern color photographs, archival B&W images, and multi-color maps. The maps are plentiful, with their small-unit representations and historical terrain renderings designed to be complementary to the text. This section provides a listing of regiments and/or brigades that were present, often with numbers data included. Short biographies of the higher command level leadership of both sides (brigade level or higher) are located in this section, with photographs. Casualty levels, including regimental totals, resulting from the fighting around each stop are listed here. In addition, a subsection titled Individual Vignettes is frequently inserted here, offering a more personalized insight into the battle's terrible losses. Numbers 3 and 4 together provide a broad picture of the human face of the fighting, from the top generals on down to private soldiers. Here, the civilian presence is emphasized in a fashion unique to Civil War tour guides. The section effectively reminds visitors that battles typically represented a lasting disruption to the lives of area residents. Effects on property and livelihoods were all too often ruinous, with post-war compensation incomplete and late, if any was forthcoming at all. This is another element that sets A Field Guide to Gettysburg apart from the typical Civil War battlefield guidebook. In addition to offering excerpts from veteran letters, memoirs, and memorial dedications, the written records of civilian observers, and even some historiographical issues, are discussed. This is also the section containing additional sidebars of interest. The book itself is of robust construction and should hold up well to repeated use in the field. The paper is thick and heavy, with a high gloss finish that will help keep the pages in good shape. Many Civil War battlefield guide series promote their volumes as equally useful to armchair readers and field explorers, but the Reardon and Vossler Gettysburg and Antietam titles really do fulfill this promise like no other contenders in the literature. In addition to its unique elements, A Field Guide to Gettysburg, Second Edition has all the best features of the genre in unmatched balance. It's unclear what ambitions the authors have beyond the 'Big Two' of Civil War battlefields, so now might also be an appropriate time for a final plea to take this already tightly-honed system and apply it to a whole series of battles from all major theaters. * - A Field Guide to Antietam: Experiencing the Battlefield through Its History, Places, and People (UNC Press, 2016). 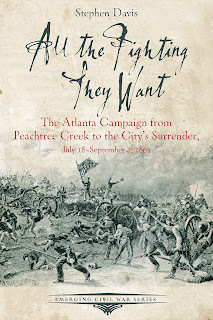 • All the Fighting They Want: The Atlanta Campaign from Peachtree Creek to the City's Surrender, July 18-September 2, 1864 by Stephen Davis (Savas Beatie, 2017). This newest volume in the ECW series is the follow on to Davis's A Long and Bloody Task: The Atlanta Campaign from Dalton through Kennesaw to the Chattahoochee, May 5-July 18, 1864 (2016). 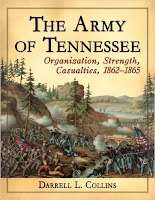 The book begins with John Bell Hood's appointment as successor to Joe Johnston as commander of the Army of Tennessee, with the title quote an excerpt from William T. Sherman's alleged reaction to the news. Chapters cover Peach Tree Creek, the Battle of Atlanta, the bombardment of the city, the Battle of Ezra Church, the Union cavalry raids, Utoy Creek, and Jonesboro. As with all (or at least most) series volumes, there's a short driving tour and an appendix section. The last discusses Atlanta monuments, the artifact collections at the Atlanta History Center, and the Atlanta cyclorama. Orders of battle complete the volume. Several books on Civil War general and post-war military reformer/thinker Emory Upton are slated for publication in 2017. David Fitzpatrick's Emory Upton: Misunderstood Reformer (July) will, I believe, be the first full-length biography to emerge since the Centennial-era volume from Stephen Ambrose. While Upton is still viewed as an important military intellectual, "as David J. Fitzpatrick contends, Upton is also widely misunderstood as an antidemocratic militaristic zealot whose ideas were “too Prussian” for America. In this first full biography in nearly half a century, Fitzpatrick, the leading authority on Upton, radically revises our view of this important figure in American military thought." The author addresses in the book many aspects of Upton's legacy that he feels have been badly misinterpreted. "By showing Upton’s dedication to the ideal of the citizen-soldier and placing him within the context of contemporary military, political, and intellectual discourse, Fitzpatrick shows how Upton’s ideas clearly grew out of an American military-political tradition." Also this summer, the Voices of the Civil War series will published two volumes of Upton papers–Correspondence of Major General Emory Upton, Vol. 1, 1857–1875 and Correspondence of Major General Emory Upton, Vol. 2, 1875–1881 –edited by Salvatore Cilella, whom readers might recall as the author of the highly regarded unit history Upton's Regulars: The 121st New York Infantry in the Civil War (2009). by Darrell L. Collins (McFarland, 2017). Collins has authored similar reference studies of the great eastern theater antagonists, the Army of the Potomac and Army of Northern Virginia. Though all of the books in the series are similarly O.R.-based, significant tweaks and improvements to format and content were made between the first two volumes, and hopefully this trend continues here with the newest release. 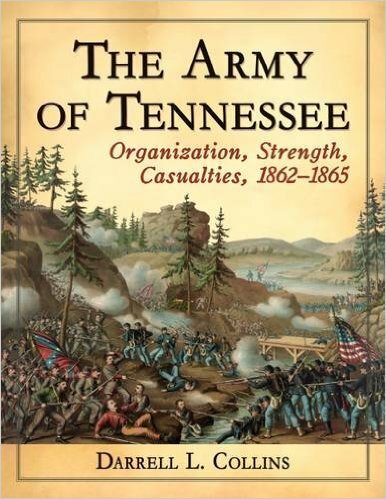 The Army of Tennessee was only officially designated as such late in 1862, and the book also covers the earlier formations that would eventually become its constituent parts. As the subtitle suggests, the book is organized into three main parts: organization reports, strength reports, and casualty reports, all at regular time intervals and at various descending unit levels (army, corps, division, brigade, regiment, and battery). Unit and commander names are listed in separate indexes. 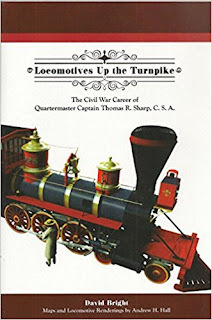 Review of Bright - "LOCOMOTIVES UP THE TURNPIKE: The Civil War Career of Quartermaster Captain Thomas R. Sharp, C.S.A." Often mentioned in the literature but never truly elaborated upon, the famous "Haul" is one of the most intriguing railroad stories of the Civil War. At a moment early on in the war, Stonewall Jackson cleverly trapped a vast amount of Baltimore & Ohio Railroad equipment in the lower Shenandoah Valley. Given the lack of unhindered track connections, the problem became how to get this valuable booty south to supplement overworked and underequipped Confederate railroads. 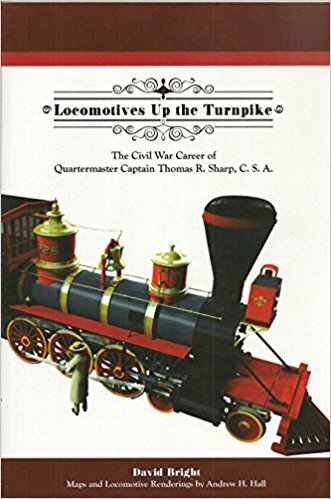 Over a period of months (June 1861 through May 1862), Confederate quartermaster and rail construction expert Thomas R. Sharp supervised the transport of 17 locomotives and over 100 cars of various types over roads (including the macadamized Valley Turnpike) using men, horses, and oxen. David Bright's dual-focused Locomotives Up the Turnpike is a microhistory of the "Haul" and a biographical treatment of the man most responsible for its success. About half the narrative is devoted to Bright's meticulously reconstructed account of the Haul. In addition to being both a testament to still heavily discounted Confederate engineering prowess and the literature's first truly comprehensive and primary source based history of the event, the book very effectively counters the many naysayers past and present. Contrary to common belief, abundant evidence that the event truly happened exists in the archives, and Bright was able to compile hundreds of these primary source documents as the backbone of his study. The mental image of teams of men and horses dragging enormously heavy locomotives down primitive roads probably dominates the thinking of the doubters, but the truth of the matter is that much of the engine and rolling stock was either wholly or partially burned prior to the removal operation, and the locomotives were significantly dismantled (as an example, wooden engine trucks were often substituted for the metal trucks to lower the weight) before being moved. The processing, organization, and routes of these equipment convoys are detailed in the text. Upon the Haul's successful completion Thomas Sharp's career in Confederate railroads was far from over, and the rest of the book recounts his activities and responsibilities in North Carolina and South Carolina on a month-by-month basis. At Raleigh, Sharp managed a Confederate repair and maintenance facility until it was closed due to a short-sighted War Department policy of turning over to private firms any operation that could theoretically be managed by non-governmental enterprise. From Raleigh, Sharp moved in March 1863 to a new position as Superintendent of the Charlotte & South Carolina Railroad, a civilian job he seems to have held concurrently with his military one. The book well demonstrates the South's struggle to balance civilian vs. military needs on railroad systems generally incapable of expanding capacity. Along the eastern seaboard transportation network discussed in the book, this unsolvable problem is most strikingly illustrated during the winter and spring months of 1864, when western sources were dwindling and the needs of the armies in Virginia needed to be met from more local sources. In 1865, when advancing Union armies systematically seized and destroyed the railroads in the Carolinas, the very highly regarded Sharp was employed as something of a roaming fixer. The book is abundantly illustrated with photographs, original maps, and color artwork. For the benefit of the reader, a vast number of tables organize data of all kinds. In the appendix section, one can find among other things an effective summary rebuttal of the Haul's detractors, full 'biographies' of the locomotives saved through the Haul, and rosters of the hundreds of men (and a few women) employed by Sharp during his various postings and operations in Virginia and the Carolinas. On several levels, Locomotives Up the Turnpike is a significant contribution to the railroad history of the Confederacy. Its unique and exhaustive documentation of the famous Haul means that other authors finally have a proper source to refer to in their own work, and the question of whether the event actually occurred or not seems more than convincingly answered. Bright's study also extends proper recognition to the architect of the Haul, while in the process bringing to light Captain Sharp's other equally important services to the Confederate war effort. Finally, the book offers useful accounts of how some of the many logistical challenges of the Confederacy's Atlantic railroad network were addressed by military, state, and Richmond authorities. Recommended.